Over the past years, I have engaged in a number of research collaborations. These include comparative work with former colleagues at the Max Planck Institute of Social Anthropology in Halle/Saale (documented here), as well as research and teaching collaborations with colleagues at the University of Cologne, in China, Japan and Cameroon. I am a member of the Global South Studies Center Cologne (GSSC). Here I am part of the Thematic Research Area "Citizenship and Migration in the Global South", where I am collaborating with Prof. Dr. Björn Ahl (Department of Chinese Studies) in the project "Chinese Immigration Law and Policy: Perspectives of lawmakers, administrators and immigrants". In this context, I have also collaborated with colleagues at Sun Yat-sen University (SYSU) in Guangzhou, in particular with Prof. Dr. Li Xi Yuan (Centre for the Studies of Hong Kong, Macao and Pearl River Delta; Department of Sociology) and Prof. Dr. Li Zhigang (Department of Geography and Urban Planning, formerly SYSU, now Wuhan University). Furthermore, I have worked together with Prof. Dr. Sabine Damir-Geilsdorf (Department of Middle Eastern and Southeast Asian Studies) on the subject of migration and labour regimes in the Arab Gulf, as well as in the interdisciplinary teaching and research project "Ethnographie vor der Haustür" (Ethnography at home). Finally, I am a member of the Thematic Network "Remapping the Global South – Teaching, Researching, Exchanging" of the GSSC. The Thematic Network facilitates cooperation in research and teaching between the partner universities, which include the University of Cologne, the Universidad Nacional de San Martín in Buenos Aires, the University of the Western Cape in Cape Town, the Jawaharlal Nehru University in Delhi, and the Sun Yat-sen University in Guangzhou. From 2013 to 2016, I was the director of the University of Cologne (UoC) Forum "Ethnicity as a Political Resource: Perspectives from Africa, Latin America, Asia, and Europe". The UoC Forum included nine researchers from the Departments of Cultural and Social Anthropology, Iberian and Latin-American History, and African Studies. Our objective was to strengthen the interdisciplinary and international dialogue on the formation of ethnic identities and their use as a political resource in diachronic and comparative perspective. In this context we organised three major international conferences in Cologne and Guangzhou (2014, 2015). The second was realised together with the Center of Urban Studies of Sun Yat-sen University in Guangzhou, and concentrated on ethnicity in the context of migration and state policies. In addition, the UoC Forum organised a number of thematic workshops, as well as an exhibition and panel discussion on “Melilla – on the border of Africa and Europe?” which resulted from our collaboration with the participatory social action and research project 'Kahina'. The collaborative outcomes of the UoC Forum also include the edited volume "Ethnicity as a Political Resource - Conceptualizations across Disciplines, Regions, and Periods", published by Transcript (2015) and now open access (click on 'Volltext PDF'). Currently, I am affiliated to the project "Network Formation for Reconstructing the Paradigm of African Area Studies in a Globalizing World" (2015-2018) headed by Prof. Dr. Akira Takada of the Center for African Area Studies, Kyoto University. The project aims at facilitating knowledge exchange and academic mobility, and brings together Africanist scholars from various universities in Japan, Europe, and Africa (including Kyoto, Cologne, Edinburgh, Paris, Addis Ababa, Antananarivo, Cape Town, and Yaoundé). This affiliation has resulted from my earlier collaboration with Prof. Dr. Junko Maruyama of Tsuda College in Tokyo, with whom I have worked and published on indigenous rights movements in Africa. Previously, I was an affiliated researcher with the interdisciplinary project "Afro-Eurasian Inner Dry Land Civilisations" (2009-2014) headed by Prof. Dr. Yoshihito Shimada of the University of Nagoya. Participating in these endeavours has enabled me to learn much about the particularities of African Studies in different parts of the world, and the benefits of international collaboration and exchange. The issue of Cameroonians' urge for international migration and the possible impact of Cameroonian migrants on their home communities was the subject of a collaborative research project involving three anthropologists and ten graduate students of the University of Zurich (Switzerland) and the University of Yaoundé 1 (Cameroon). 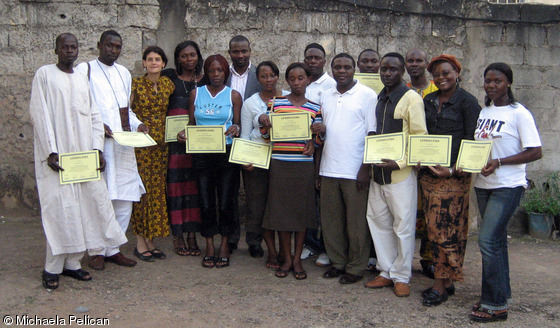 The project was conducted in Cameroon in July to September 2007 and entailed a one-week preparatory seminar, four weeks of field research and one week of data analysis. The project was generously supported by the Swiss National Science Foundation and the Laboratoire CASS-RT in Yaoundé. The focus of the project was on transnational relations of Cameroonian migrants within the Global South, and the perception of these relations by members of the migrants' communities of origin. We centred our investigations on three regional clusters: While a first team focused on intra-African migration, a second engaged with the migration of Muslim Cameroonians to Arab countries, and a third researched Chinese-African exchange relations. All three teams collected data on the motives of migration, preferred destinations, networks of migration, the role of the family in the migration enterprise, communication and exchange relations between migrants and their relatives and friends at home, as well as the perception of migrants in their host and home countries. In order to diversify our findings, we conducted research in three locations, i.e. in the two major cities Yaoundé and Douala in francophone Cameroon, and in Bamenda and its rural surroundings in the Anglophone part of the country. Pelican, Michaela and Peter Tatah and Basile Ndjio. 2008. Local perspectives on transnational relations of Cameroonian migrants. African Sociological Review 12(2): 117-127.